My sister brought Parker and Max up to meet Colten and allow them to spend some quality time with Richard and me. It’s been a few days since we’ve seen the boys and today was the first time they met Colten! It was truly a tear-jerking moment for us and the highlight of the past few weeks. 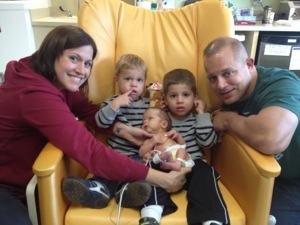 Both boys had HUGE grins when they came in and saw us and were incredibly excited to see Colten. 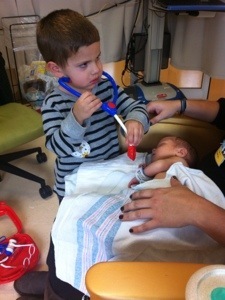 Parker came right up to him and wanted to kiss him, hug him and hold him. 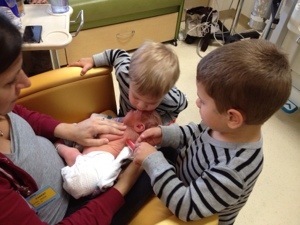 He kept saying, “I love my little brother!” Max kept pointing, smiling and saying “baby” and “Cole” (and then would proceed to point to and name everyone else in the room). 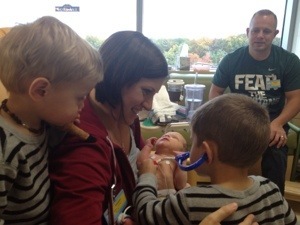 Richard bought the boys a play medical kit and as soon as Parker got it opened, he turned into Dr. Parker and started checking Colten’s breathing, ears, and giving him shots and medicine. After a few minutes of play, we took the boys over to the big indoor playroom here (yes, Mott Children’s Hospital rocks!). They had a blast running around there, then we took them down to the cafeteria for dinner. After that we walked over to the Ronald McDonald House where Richard and I are staying (ok, Richard stays there, I sleep in Colten’s room) and spent another hour playing in their playroom. We got great hugs, kisses, laughs and playtime with those boys and it was much needed. 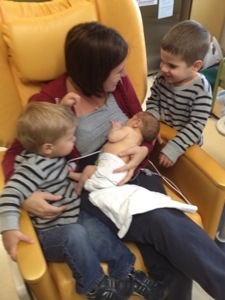 We checked in on Colten a couple times in there as well and each time they were just infatuated with him. The smiles on their face showed genuine love! We cannot wait to get home and be a family, all together! This entry was tagged brothers, NICU. Bookmark the permalink. 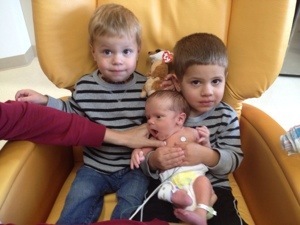 So very glad that the boys were able to meet their brother! Thank you for the continued updates and pics. You are all in my thoughts and prayers! I just wanted to say that your family is in my thoughts and prayers, and that the pictures of Colton beautiful. I worked in Pediatrics at Mott for two years and you truly couldn’t be in a better place or be surrounded by more incredible medical professionals. I volunteer at Ronald McDonald House, and actually live in Mary Markley Hall right across the street from Mott. If there is anything I can do to help out or if you ever need anything I’d be happy to help. Such a wonderful moment!!! Glad you’ll all be together this weekend!